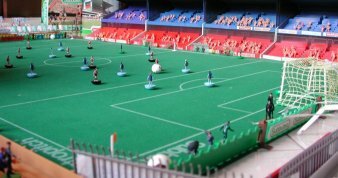 Welcome to the QC Subbuteo League! We are a band of friends from Davenport Iowa, with the objective to drink beer, play Subbuteo, and have fun. 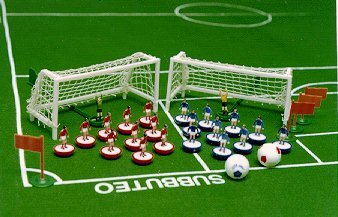 If you are a fan of Soccer, Subbuteo or just need an excuse to get away from the wife........then contact us! 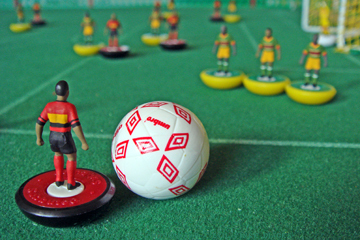 The QC Subbuteo League was established on March 1, 2008 in Davenport Iowa. After several weeks of marketing, purchasing a new pitch, and practice...we are ready to begin! Check back frequently as the season progresses and we add to our beginning website. The first weekend of league play saw some brilliant goals, and exciting "come from behind" wins!! With the QCSL underway after 1 weekend, we have already recruited another player. Chad will be joining our clan after witnessing some live Subbuteo action this weekend. We are growing at such a rate that it makes updating this website difficult! Tune in often to see how it all unfolds.